The sonnet is the ultimate expression of love. You could buy roses or chocolate, but that’s like cheating. If you really mean business, you write a sonnet. Given its complex rhythm and rhyme scheme, just getting the form right shows a certain amount of dedication. Surely anyone who is willing to spend that much time on a poem deserves a chance! So if you are willing to make the ultimate sacrifice for love (in this case an hour or two of your time), here’s how you write a proper sonnet. As you can see, although every sonnet has 14 lines, the structure varies quite a bit. 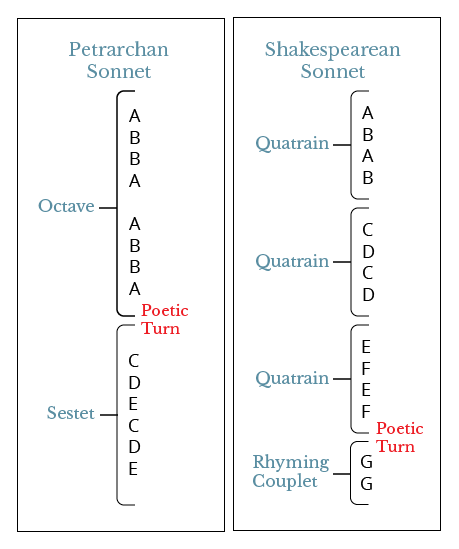 The Petrarchan sonnet is made up of two sections, with the octave (8 lines) describing some problem or tension, and the sestet (6 lines) providing a resolution. The poetic turn (or volta) refers to the change in direction, where the poet comes up with a creative and often surprising ending. The Shakespearean sonnet often has the poetic turn a little later, usually after all three quatrains (4 line stanzas) are finished. Of course, a rigid iambic meter can seem monotonous, and once you’ve mastered the technique you can play with the rhythm by introducing minor variations here and there. The last thing you’ll need is some content. Although most sonnets are love poems, they don’t have to be romantic. Wordsworth wrote about his love for the city of London. Keats expressed his passionate affection for an English translation of Homer! And John Donne wrote Holy Sonnets to God. In other words, you don’t have to wait for Valentine’s Day to write a sonnet. But we can start all over, nice and slow. Down where the keen-eyed eagle cannot see. Please could you, maybe, scratch me from behind? As you can see, sonnets don’t have too be serious or melodramatic. Have some fun and write something clever and witty. Modern sonnet writers are often more relaxed about following all the rules. Some sonnets don’t even rhyme at all. That’s because the goal is to adopt a more conversational tone. In this case “soul” and “fall” nearly rhyme, as do (to a lesser extent) “foot” and “dispute.” The effect is to make the poem less formal and more colloquial. Having a hard time getting started? Why not try some of our sonnet starters? Alright, we’re just kidding. We’re sure you can come up with something better. The main thing is to be clever and sincere, rather than flowery and gushy. That way you won’t have to be embarrassed when years later your kids discover your poetic efforts. I’m really impressed, by the way, at how clear, thorough and engaging your articles and videos are. This is a fantastic resource, which I will recommend. Thanks, Keir, for the kind words and for the link. You’re right that the explanation of iambic meter on this page may appear a bit rigid. That’s always the danger of an introduction. I’ll change the wording a bit to suggest more openness.